Alden Medical develops, manufactures and markets consumable infection prevention products for a variety of markets, including Kidney Dialysis, Endoscopy, Dental and Agricultural. Why choose Alden? 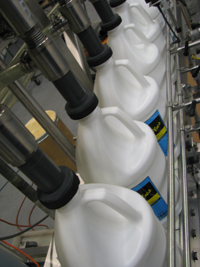 We have been manufacturing FDA Regulated, liquid Class II Medical Devices and EPA regulated disinfectants for 20 years. We have the experience to avoid manufacturing pitfalls and the experience to navigate your new or existing product towards success. We view our customers as partners. We know that our success is dependent upon our partners' success. Wouldn't you rather have a partner working for you? We offer our partners full service blending, packaging and distribution. Our FDA and EPA registered 45,000-square-foot facility contains efficiencies that have made us a leading manufacturer of many products for a variety of industries and can support production for any business needs from pilot batches to full scale production. © 2011 Alden Medical. All Rights Reserved.